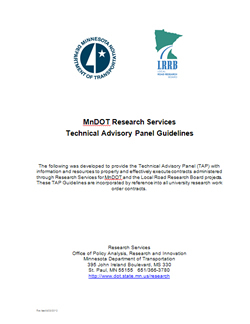 Every MnDOT research project, however it is funded, is guided by a Technical Advisory Panel. Each member of the Panel has a particular role to play that is essential to the success of the research project. TAPs guide the research, and review and approve deliverables. Typically, four to six people serve on each TAP. Additionally, other stakeholders may attend TAP meetings to stay informed of project progress, though these “friends of the TAP” don’t influence project scope or task approvals. If you’re requesting a research project, you’re likely a good candidate to serve on the TAP. Research Services can coach you on what’s required. You can also learn more by watching the video series below. Technical Advisory Panels play a crucial role in transportation research projects in Minnesota. The goal of this video series is to help clarify the roles and responsibilities of the TAP members. Every TAP is composed of at least three members: the principal investigator, who performs the research; the technical liaison, who is the champion for the research, and the project coordinator, who monitors the research contract. Additional members may also serve on the panel to bring needed expertise to the project. In this video segment, we will be talking about the roles and responsibilities of the project coordinator and other Research Services staff. The PC, who is a Research Services staff member, monitors the contract documents, participates in TAP meetings and decisions, and assures the research milestones and end products are on-time and on-budget. The principal investigator is the expert from a university or consulting firm who is contracted by MnDOT to perform the research and deliver the findings. In this video, two experienced principal investigators — Professor Catherine French with the University of Minnesota and Michael Marti with SRF Consulting Group, Inc. — share their thoughts on the responsibilities, challenges and rewards of serving as PI on Minnesota research project TAPs. The Technical Liaison represents the interests of the research sponsor, either MnDOT or the Minnesota Local Road Research Board. The TL provides technical expertise and guidance throughout the project and approves the research work plan, amendments and final deliverables. In this video, two experienced Technical Liaisons — MnDOT's Dwayne Stenlund and Mark Maloney from the City of Shoreview — share their thoughts on the responsibilities, challenges and rewards of serving as TL on Minnesota research project TAPs. Additional panel members may be included on the TAP to represent other state or local practitioners, users of the research or other interested stakeholders. These additional panel members provide technical assistance and review research deliverables. In this video two experienced panel members — the Minnesota Department of Natural Resources' Peter Leete and Bryan Nemeth from Bolton & Menk, Inc. — share their thoughts on the responsibilities, challenges and rewards of serving on Minnesota research project TAPs.